When it comes to 80mm thermal paper, PrinterStock.com is the name to trust. We offer these high-quality thermal printer paper rolls for remarkably low prices, which allows you to maintain a healthy bottom line for your business. Plus, these BPA-free paper rolls are safe enough for ongoing, everyday use not only for your employees, but for the environment as well. You can feel good about investing in this paper because it won't expose you or your employees to potentially harmful BPA. Even considering the great benefits and superior quality of this paper, we keep the price competitive and low with affordable shipping to ensure the best deal for your business operations. These 3 1/8 thermal paper rolls are from a reputable company, and we’re confident that you will be completely satisfied with the quality of this product. 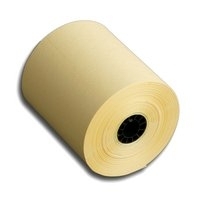 As with everything we sell, these canary yellow thermal paper rolls 80mm are backed up by our 100-percent satisfaction guarantee. In the unlikely event that you're unsatisfied with your purchase, please contact us. With 50 rolls per case, this 80mm thermal paper is especially affordable, and you can stock up quickly and easily by ordering what you need today.